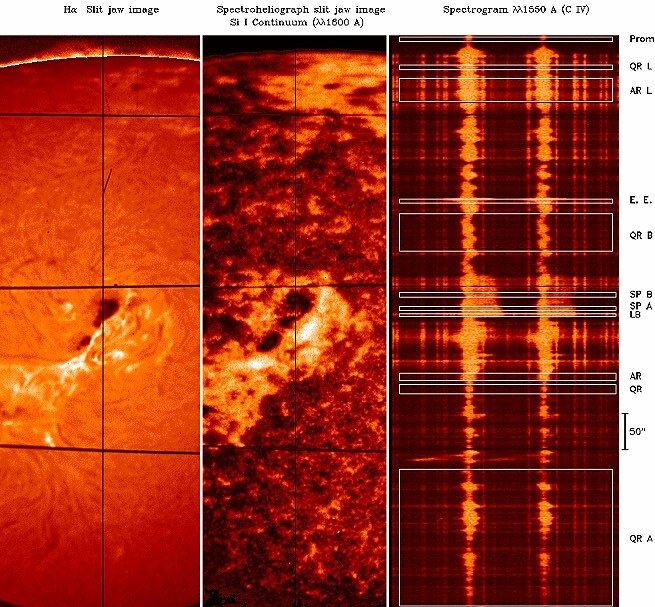 An ultraviolet spectral atlas of different solar features, including sunspots, active regions, and an explosive event is available from the NRL Solar Group. The spectra are based on observations obtained with the US Naval Research Laboratory (NRL) High Resolution Telescope and Spectrograph (HRTS) with the best available spatial and spectral resolution. The spectral range covers 120 - 173 nm, and includes a large number of emission lines formed in the solar chromosphere and transition region, as well as continuum radiation from the temperature minimum region in the solar atmosphere. Click here for a listing of the contents of the atlas. Click here for the abstract of a paper describing the atlas. Click here for a JPEG representation of part of the atlas. Click here for a plot of the entire atlas spectral range. Click here for a plot of some line profiles from the atlas. The profiles labelled with a letter refer to the the similarly labelled regions along the slit in the JPEG representation available above.